The global pigments market is envisaged to showcase a fragmented characteristic as companies of similar share and size operate in the industry. However, there could be high exit barriers existing in the market due to the presence of inflated fixed costs and vast capital investments made at the initial phase. With integrated value chain in place, established firms in the industry are anticipated to join an intense rivalry. Another reason for the intensified competition could be the not-so-easy market profitability. As a result, throughout the forecast period, the level of competition is predicted to stay high. Players such as DIC Corporation, Clariant AG, Altana AG, and BASF SE are involved in the forward integration of pigments operations. 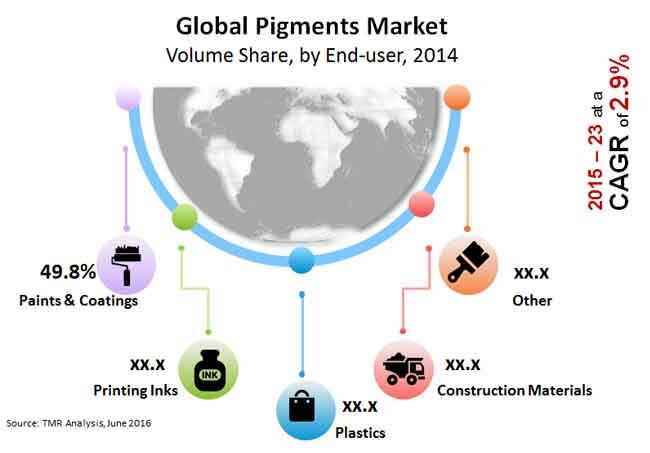 According to a report compiled by Transparency Market Research (TMR), the global pigments market could rake in a telling revenue growth of US$31.98 bn by 2023 while rising from US$24.46 bn in 2016. The CAGR expected to be recorded by the market between 2015 and 2023 is 3.8%. Inorganic pigments are prognosticated to take a lion’s share of US$23.81 bn by the concluding forecast year on the back of the flourishing market for titanium dioxide. Asia Pacific could top the global geographical market with an almost 47.0% share in 2023. Besides adding color, pigments are used to impart light and heat stability, brightness, and a glossy effect to paints and coatings. On account of industrial development, the paints and coatings sector in developing nations has been right on the progress track. This is expected to give a strong boost to the global pigments market. Although the per capita paint consumption in emerging countries is less compared to that in developed countries, the economic development in the ASEAN, China, India, and the GCC is envisioned to improve the trend. Since the spur in the construction industry is correlated with the GDP growth in Asia Pacific, the paints and coatings sector is foreseen to witness a staggering growth, thus adding impetus to the global pigments market. Pigments work as a critical element in the plastics industry because of their aesthetic and coloring effects, superior compatibility, moisture and heat resistance, and capability to increase stability in plastics. Being a major consumer of pigments, the advancing plastics industry could offer some great opportunities for players in the world pigments market. Pigment manufacturers are foretold to face the challenge of maintaining environmental sustainability in the wake of eco-friendliness. Organic pigments such as azo compounds can cause toxicological effects and lead to carcinogenicity and genotoxicity in humans due to the release of numerous aromatic amines. The European Commission (EC), Ecological and Toxicological Association of Dyes and Organic Pigments Manufacturers (ETAD), and Danish Environmental Protection Agency (EPA) have already announced their disagreement with the use of azo pigments. However, the advent of nanotechnology making possible the development of nanoparticles of inorganic and organic pigments to less than 100 nm is prophesied to open new avenues for advancement in the pigments market. The improved performance and grander properties of nanopigments have landed them attractive applications in industries such as cosmetics, photovoltaic cells, and cathode ray tubes.